There are few things that I love more than roasted butternut pumpkin. Apart from tomatoes it would have to be one of my favourite vegetables. It’s a vegetable I always have on hand, wherever possible. Not only is it absolutely delicious, it’s extremely flexible and can be used to make delicious soups, tarts, pizzas, risottos, pastries, and salads, which I’m sharing with you today. This salad came about in mainly because I wanted to use a couple of things I had in the fridge. On Friday I made some goats cheese for the Beetroot Jalousie we had for dinner on Friday, when my parents first arrived for their visit, and had about half of it left. I also had a globe artichoke in the fridge, which I’d received in our farmers box, just waiting to be used. So I combined the two with some roasted butternut pumpkin to make this deliciously healthy salad. It was all topped off with a honey, lemon and mustard vinaigrette, which, incidentally, is my new favourite salad dressing, and Troy and I devoured this over lunch, as my parents had gone out, and caught up on The Walking Dead. Note to self for next time, don’t try to eat while watching The Walking Dead! So tell me, what is your favourite vegetable and are you a Walking Dead fan? 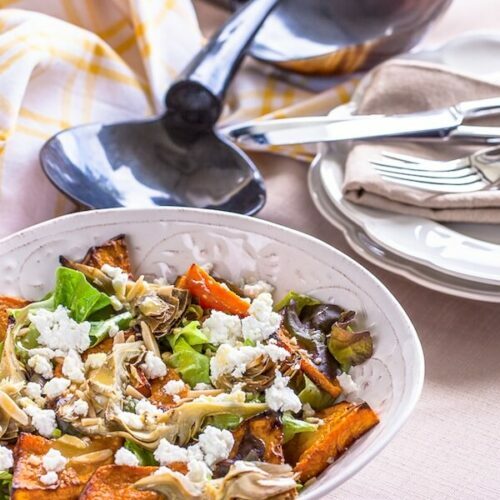 This Roasted Butternut Squash, Artichoke & Goats Cheese Salad came about in mainly because I wanted to use a couple of things I had in the fridge. Preheat the oven to 180 celsius (350 fahrenheit). Add the butternut squash to a bowl with 1 tbs of the olive oil and season to taste. Toss to combine and place on a baking tray lined with baking paper and roast for 15 minutes until tender. Set aside to cool. Place a piece of foil large enough to encase the artichoke and place the artichoke on top. Pull up the sides of the foil to make a well and add the lemon juice and olive oil and mix gently. Season and then close the foil over and roast for 15 minutes, or until tender. set aside to cool. To make the dressing, combine all of the ingredients in a mini food processor and process to combine. Alternatively combine the ingredients in a glass jar and shake until combined. 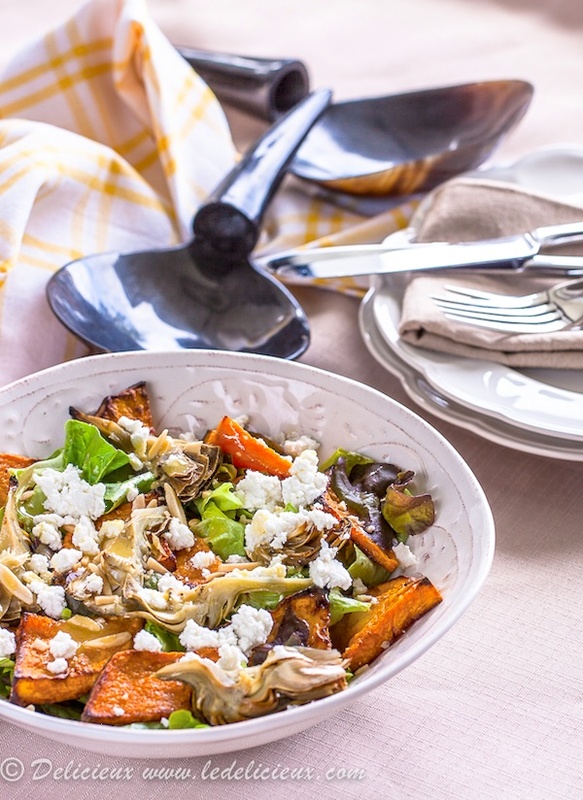 To assemble the salad place the lettuce in a bowl and top with the roasted butternut squash and artichoke before scatting with the crumbled goats cheese and slivered almonds. Add the dressing immediately before serving and toss to combine. If you aren't familiar with trimming and preparing an artichoke, see this link for step by step instructions. Alternatively substitute with marinated artichoke hearts and skip the roasting step. What a gorgeous salad! I need to try butternut square apparently! Not sure the last time I had it! I love everything about this, Jennifer – I think you’ve capture all of my favorite ingredients in one salad. Lovely! This looks just exactly like the salad I wanted to9 eat today. You just cant seem to get a salad like this in a cafe can you..? I’m a big butternut squash fan myself, and I like this nice change from leafy green salads. I’m with you, butternut squash is one of my favorite veggies as well and I love it with goat’s cheese. this is absolutely gorgeous, Jennifer! delicious! This salad look and sound fantastic! Great flavors and combination! Well done honey! Gorgeous salad, I would love to have a big plate full and your photos are making my mouth water. Can’t say I’m a Walking Dead fan, but my favorite vegetable tomatoes or lately sweet potatoes. Love everything in your salad-pinning! I see loads of salads in blogosphere..love the clicks, Jen. Love the baking part in the salad..gives a wonderful aroma to the salad. I love roasted butternut squash and the mustard vinaigrette sounds like the ideal topping – I’d definitely go for this salad! Beautiful salad — perfect flavors and spring colors!! How beautiful. I adore vegetable dishes but have never prepared this way (roasted veggie salad). I love every single part of this dish. The ingredients are all my favorite, roasting them…very nice, and your vineigrette sounds wonderful with Dijon and lemon. I need to make this – very light and healthy and I love it very much. All the components of this salad are ingredients I love but I wouldn’t have thought to pair artichokes with butternut squash. Looks like an absolutely delicious salad – perfect for a light lunch and the transition from winter into spring. What a gorgeous looking salad. Love the honey mustard vinaigrette you used. Thanks 😀 It’s my new favourite vinaigrette. See you are superwoman! Is it sad that I have no clue what teh Walking Dead is?! Off to Google! And I’d say my favorite vegetables….that’s a hard one. I do like tomatoes, and peas and spinach….oooh the list continues. Looks wonderful! Love the textures in this salad!! This looks amazing! I love salads and would love to try this out. Yum!!! That is too funny! I guess Walking Dead and lunch are not the best combo 🙂 The salad however is fantastic! I love the texture play off with the artichokes and squash…beautiful! This looks fantastic – I love goat cheese with butternut squash, and the addition of the artichoke is brilliant. I made the mistake of trying to eat pizza once while watching The Walking Dead – won’t make that mistake again. I can’t even watch it right after dinner! Just in case someone isn’t caught up I won’t spoil anything, but I had a hard time even watching bits of the season finale – no food involved. It was rough. But MAN I love that show! I am very fond of butternut squash as well and will admit to purchasing the large containers of already cut squash at the (unnamed) big box warehouse. I then have the sweet morsels ready at a moments notice for recipes such as your irresistible salad! My this salad does have some tasty elements. 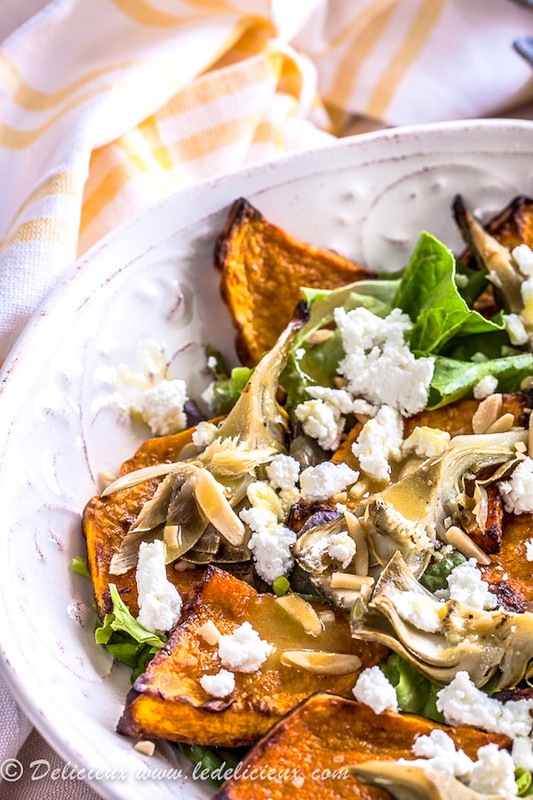 Love the roasted butternut squash and the goat cheese together-yum! This type of squash is pretty big, but I never have a problem making use of it. Great post! This is completely my style of salad. It is perfect for autumn and I can’t wait to make this one. I’m of the opinion, for those who care to listen, that goat’s cheese makes EVERYTHING taste wonderful. Even fridge leftovers – which seem to be very delicious at your place! Great salad! I love pumpkin/butternut squash and tomatoes too! My other favourite would have to be green beans. All top 3 veggies. Yuuuuuum. A marvelous dish! This salad is perfect and so droolworthy. Totally up my alley.